MY magical, mystical tour of Montreal started in 1966 when I arrived there in the late summer of that year. Mayor Jean Drapeau’s dream of Expo had come true. It was one of many that he realised. It was around the corner. The man-made island in the middle of the St. Lawrence River was complete. Feverish activity gripped the workers from just about every country in the world who worked overtime to complete the pavilions. A man-made island? Yes! Another of Mayor Drapeau’s dream —the Metro (a system of underground trains) was also nearing completion. Started many years ago, it involved boring tunnels under the island city of Montreal. Millions of cubic feet of earth had to be excavated. This was then dumped in the middle of the St. Lawrence river and voila! There was another island. Today, the island is known as the Jean Drapeau park. It is a beautifully landscaped area that has the Casino, which was the French pavilion during Expo ‘67. It also houses the Formula One race track. Jaguars magazine has this to say of the Montreal F.1 track, "if the F.1 world was to have its academy awards, Montreal would be in line for an Oscar". The F.1 track was also Jean Drapeau’s doing. Negotiations between the city of Toronto and the F.1 world body team had ended in failure. The city of Toronto had said "no" to hosting a F.1 Grand Prix event in that city. Within hours, Mayor Drapeau had contacted the team, invited them to Montreal and by next day, when they met, the F.1 team thought that they could race in the streets of Montreal. "I got a better idea", said Drapeau. "What about Isle Notre Dam (This was part of the man-made island). We’ll build you a track!". That was it! This month Montreal celebrated the 25th G.P. to be held there. The track is called the Circuit Gilles Villeneuve, after the French-Canadian F.1 driver. 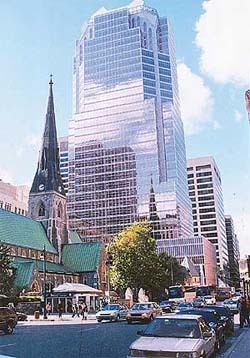 One of Montreal’s more recent miracles is the Christ Church Cathedral. 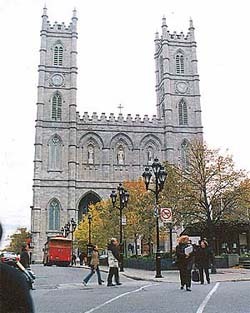 The Cathedral stands facing St. Catherine Street West, and is bound by University St., Union St. and De Maisonnuve Boulevard to the North. It is a huge area of land with just the cathedral standing on it. The flock shrank, church attendance fell, so did revenues. the cathedral was facing a serious situation, financially and spiritually. And then a brilliant solution was found. They excavated around the cathedral and positioned hydraulic jacks under it and raised it 40 feet! They constructed shops, theatres, restaurants and corridors in the space below the cathedral. A whole plaza, in fact. Sixty thousand trucks moved the excavated soil out in containers. They were taken 200 km to be dumped till needed again. The work started in 1982. In 1988, the work was finished and the cathedral was lowered to its original spot. Business as usual! Where there had been just a park at the rear of the cathedral, now stood Place De La Cathedral, a modern high rise commercial complex, generating funds in abundance. Truly magical and mystical and mechanical! At the Guru Nanak Darbar Gurdwara in LaSalle, Quebec, another marvel of engineering can be seen. This gurdwara replaces the first gurdwara that came up in Montreal in the 70s. That was an old Anglican Church in LaSalle, which the Sikh community had bought. At that time the church was good enough to accommodate the faithful but the old church did not have all the facilities and was not suitable. It was too small to accommodate the growing numbers. Originally, there were only a couple of hundred people who attended but this number later swelled to a couple of thousand. The gurdwara was always overcrowded and people would spill out on to the road. This became a traffic hazard and in case of fire, evacuation would be a problem. There is a legal limit for crowds in a building in Montreal. In the new gurdwara, the diwan hall can take 1200 persons and about the same number can be accommodated in the langar hall downstairs. The cost of the new gurdwara so far has been Canadian $ 7 million and there is a shortfall of about Canadian $ 1 million, so work is at a standstill. The gurdwara’s nishan sahib is its most unique feature. It is claimed to be the tallest in the world at 35 metres. This claim could be contested. What is not debatable is the fact that the nishan sahib is hydraulically operated. Press a button and the mast comes down to ground level! This was built at a cost of Canadian $ 75,000. One person donated this money with instructions that it should be used to make a hi-tech nishan sahib. This feature comes in handy when the covering has to be changed. The Diwan hall is also unique. It has no pillars. The construction committee decided that the sangat should have a clear view of the Guru Granth Sahib when the prayers were being read out. Unfortunately, this was decided once the hall had already been built. To redo the architectural drawings and rebuild cost a million dollars more. Nevertheless, it is an engineering marvel, a three-storeyed building where the main hall has no pillars to support the upper floors. The exterior finish is in die-cast panels of concrete and they have Ek-Onkar and the khanda imprinted on them. These customised panels also increased the price of construction considerably. The interior makes extensive use of marble and granite and the railings are of stainless steel. It is all very lavish. Alas! There was no budget for maintenance. Which means that the exterior already has a run-down look. Railings are broken, the flower beds need weeding and rust is showing. With a shortfall of a million dollars to complete the building, another million will be required to give it a facelift. The stadium and Velodrome built for the 1976 Olympics is yet another stop on this magical mystical tour. A huge structure, its most unique feature is the overhead RCC crane, which stands out against the skyline at an angle. The stadium has a covering and at the press of a button the crane pulls the covering off, making it an outdoor stadium. In case of rain or snow the covering can be lowered! I didn’t meet anyone who had seen this work! A cable-car whisks you 270 metres up to the observatory at the top of the world’s tallest inclined structure in just two minutes. On a clear day, it is possible to see up to 80 km away. Surely the highlight of Montreal’s tour, though not mechanical but definitely magical, is Old Montreal. The streets, the port and the houses date back a couple of hundred years. The city is immaculately preserved in its pristine condition. It is a trip back in time. As you exit the Metro and walk up the gentle hill to the Basilica Notre Dame, its like getting out of a time machine. The Basilica dates back to 1829 and is built in Gothic-Revival style. In downtown Montreal, there are wide boulevards and high-rise buildings, narrow cobblestone streets and old buildings, some dating back 300 years. Downtown Montreal also has its share of elegant streets. Crescent Street, St. Catherine, McGill College, Sherbrooke Street. They however, belong to the turn of the last century. Old Montreal is a bit of France transplanted in Quebec. The only thing contemporary are the cars in the streets. 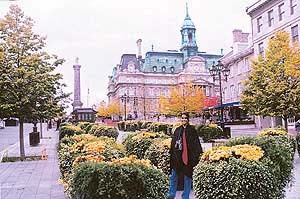 The ornate French-style City Hall looks on to Place Jacques Cartier — an oasis of blooming flowers in a sea of buildings. Strangely, it is Lord Nelson’s statue that dominates Place Jacques Cartier. The clip-clop of horses’ hooves pulling an open caleche is a familiar sound and sight. Bear skin rugs and hot water bottles keep the tourists snug. An ingeniously devised box is tied to the horses rear end. It keeps the streets remarkably clean of horse manure. 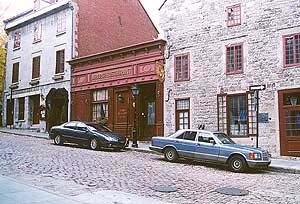 Montreal, a bit of the old world existing in Canada. A bit of Europe, a lot of Paris. But in the final analysis, Montreal is unique. It is one of a kind and therein lies its magic.